I was anxious to get the Scout on the road after getting back from Colombia this weekend, but I knew there was an issue I needed to address first: the passenger door latch mechanism had spun forward so that it wasn’t engaging the door pin, so the door wouldn’t close. I’ve been through this before with the driver’s door, and eventually swapped out the mechanism for a spare I’d pulled from the Wheaton Scout. As I dug into this latch I realized I was going to have to do the same thing for the passenger door. 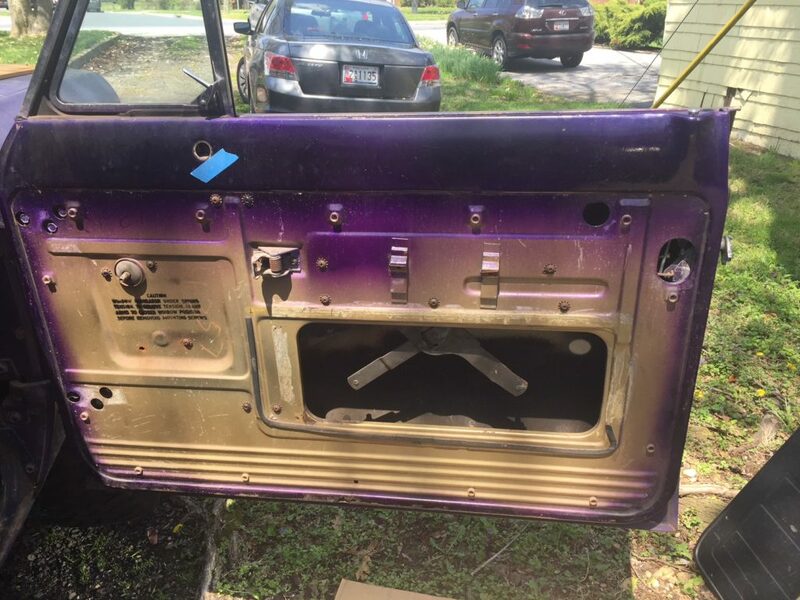 The complicating factor is that the latch assembly is tucked tightly behind the rearward track for the door glass, and won’t come out without the track out of the way. (Purple over gold poly. Gorgeous, I know. This is after the glass came out). Looking at my own directions, I started pulling the butterfly window but soon remembered that was not necessary. I cranked the main window down, pulled the clips off the scissor assembly, unscrewed the tab atop the butterfly frame and pulled the window out of the way. 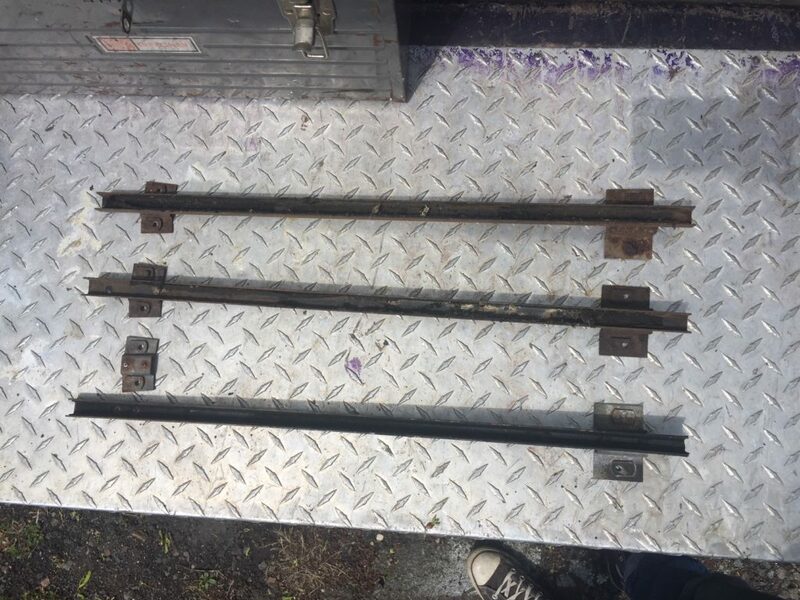 The track came out easily but the rivets holding the screw plate to the track finally gave up and broke off after repeated abuse. (Broken track on the bottom: note the mounting plate has come de-riveted. Two spares are at the top). Luckily I had pulled two spares from the Wheaton Scout. There was a bolt stuck in one of the screw holes, so I hit it with PBlaster, then heated it up on the bench grinder, and with a set of channel locks it came right out. The latch assembly and track got hit with some white lithium grease before I bolted them in, and the whole door went back together quickly. Then I tore the driver’s door down and did the same with that assembly to get the window moving more smoothly on its tracks. 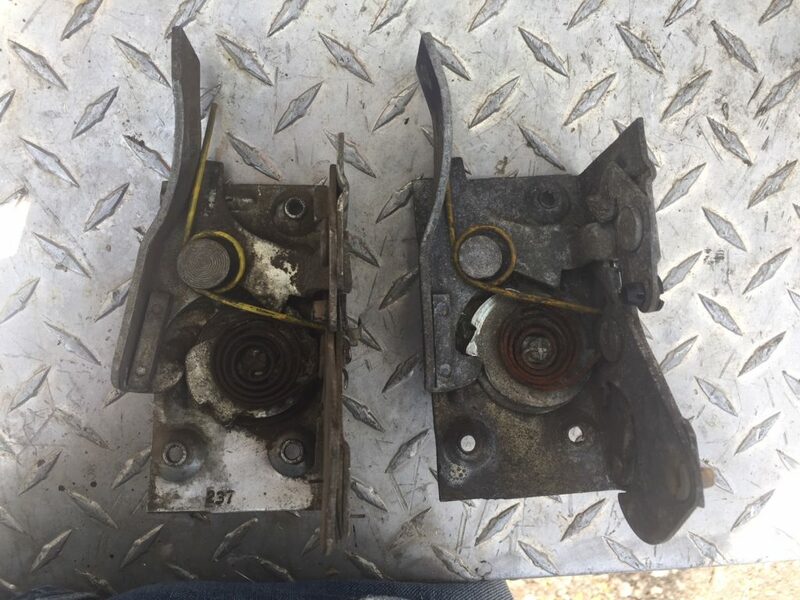 (Bad latch on the right. The cam was not under tension from the spring, so it barely worked). Once everything was buttoned back up I took her out for a spin around the block and the first new gas she’s had since December of 2017. The brakes feel tight and even–the pedal is firm and catches much quicker than the old manual booster ever did, and the truck doesn’t pull to either side like it used to. I still have to adjust the drums by reversing and braking, but overall I’m thrilled with the upgrade. 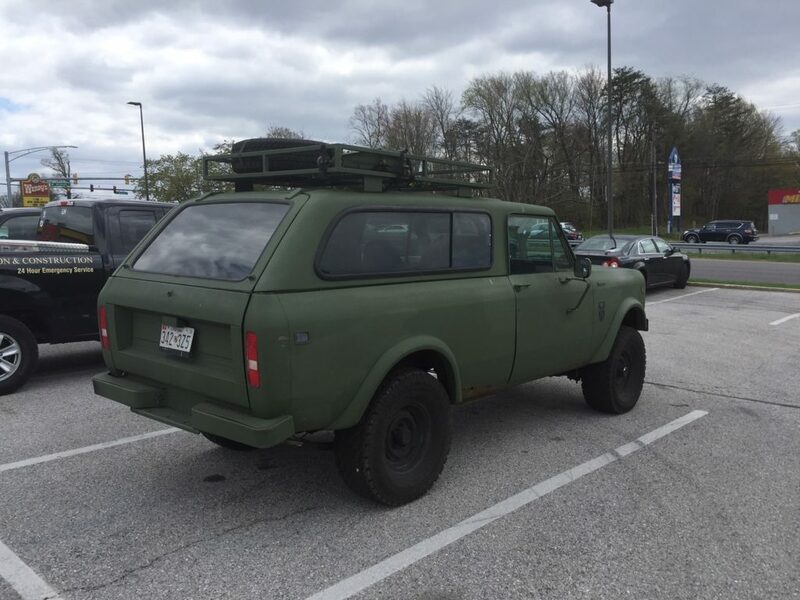 As I drove down Frederick Road, I caught sight of the Diesel Traveler coming my way and waved to the owner, who passed me on the narrow street. I turned around and gave chase but lost him as he crossed Rt. 40. At some point, I’ll catch up to him. Update: we saw him parked nearby this afternoon when we went out for lunch.